Have you ever wanted to get away from it all for a day? Do you sit in your office and dream about exploring an abandoned island full of histories and stories? 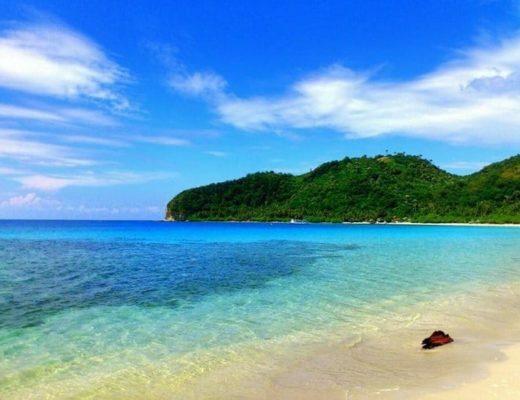 Then Fortune Island, Nasugbu is the place for you!! Fortune Island used to be a private island with an upscale resort that was closed down in 2006 because there was no fresh water source and extensive damage had been done by a typhoon that caused a lot of damage. So these days, if you head to Fortune Island you will need to expect to rough it out. There are no resorts, not bathrooms and no accommodation. 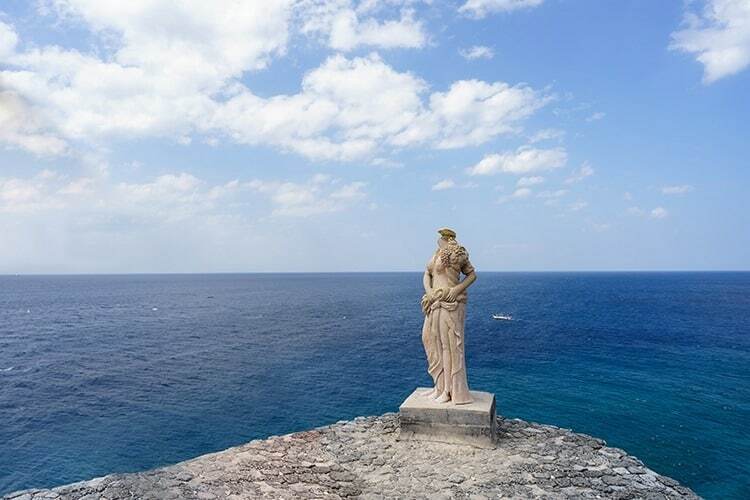 Only beautiful beaches, limestone cliffs and an acropolis with Grecian pillars and statues! Where is Fortune Island, Batangas? 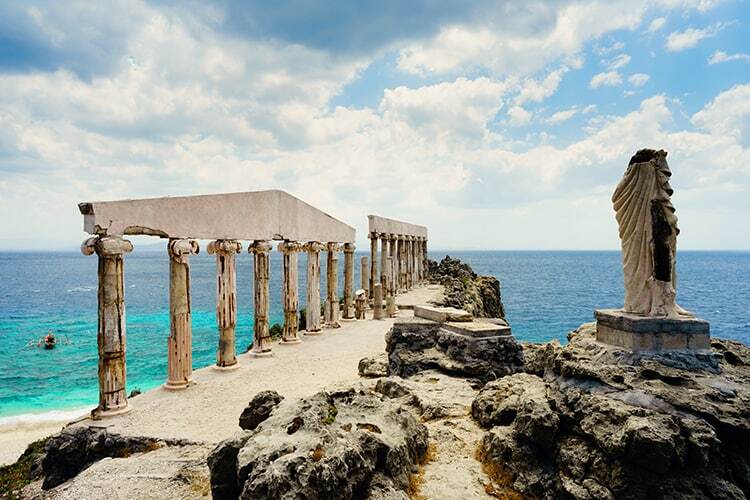 Fortune Island is about an hour away from the coast of Nasugbu in Batangas, Philippines in the beautiful waters of Luzon. Although it is a tiny island, it is filled with extreme beauty. The lovely sunsets, pristine white beaches and vivid blue water will bring joy and peace to anyone's soul. You can either choose to camp on Fortune Island itself, or you might prefer to go to Fortune Island on a day trip. Find the best resort to stay in at Batangas on our post here. The first step to visiting Fortune Island is figuring out how to go to Fortune Island. You can choose between public transport or rental car. If you are taking public transportation then you will want to start at the Buendia bus station you will want to get either the BSC or DLTB bus heading in the direction of Nasugbu. The bus trip will take around 4 hours. 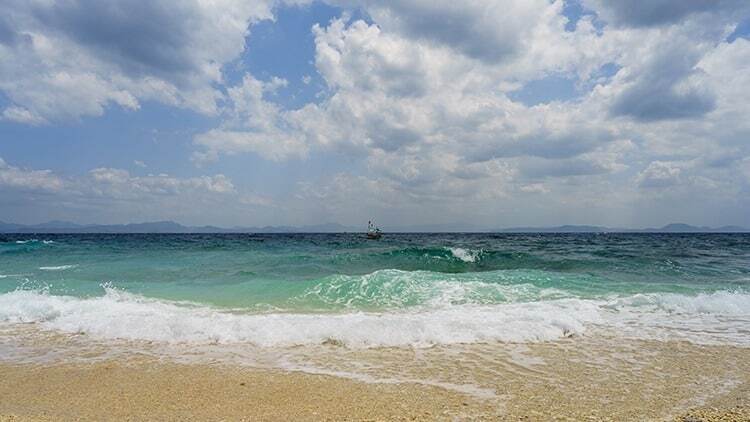 Once you get to Nasugbu (hop off at Jollibee-Nasugbu) you will want to hitch a ride on a tricycle and let them know you are heading to Fortune Island Resort (which is still on the mainland). Once you are at the resort you will have to pay some fees (they can vary) and charter an outrigger boat to get to the island. The boat trip will take around 1-1.5 hours. If you have access to a car and plan on driving, you will be able to cut down on your travel time to Fortune Island in Batangas quite a bit. You will want to drive via Cavitex. Then you will continue on to Governors Road and Nasugbu Ternate Highway until you arrive in Nasugbu. Once you are in Nasugbu you will turn right to C. Alvares, eventually turning right on Apacible Blvd. You will continue on this road until you are at the Fortune Island Beach Resort. Don't forget that it is important to grab some insurance for your rental car as well. You can easily hop online to sites like RentalCover to get an instant quote. Always better to be safe than sorry! Drinking Water: Since there is no clean water source on the island, you will want to make sure that you bring plenty of drinking water, especially if you are going to be camping out overnight. Portable Power Bank: There is also no electricity, so if you are worried about your cellphone dying you will want to invest in a solar powered charger to bring with you on your trip. Click here to see our favourite portable power banks. Snorkeling Gear: If you plan on snorkeling or doing any kind of diving, you will have to bring your own equipment with you as well. Camping Gear: If you plan on camping then you will want to bring all the necessary camping gear with you. If you are going to be camping don’t forget to bring a way to cook food and any tools you might need. Trash Bags: Also, make sure to bring bags for any trash you may produce while on the island, there on no trash cans for you to get rid of your trash while there. Toilet Paper: As you have probably figured out by now, this abandoned island certainly lives up to the name, since there are no decent bathrooms on the island you will also want to make sure you bring your own toilet paper. Other things you will want to bring are sun block, towels, first aid kit and food. 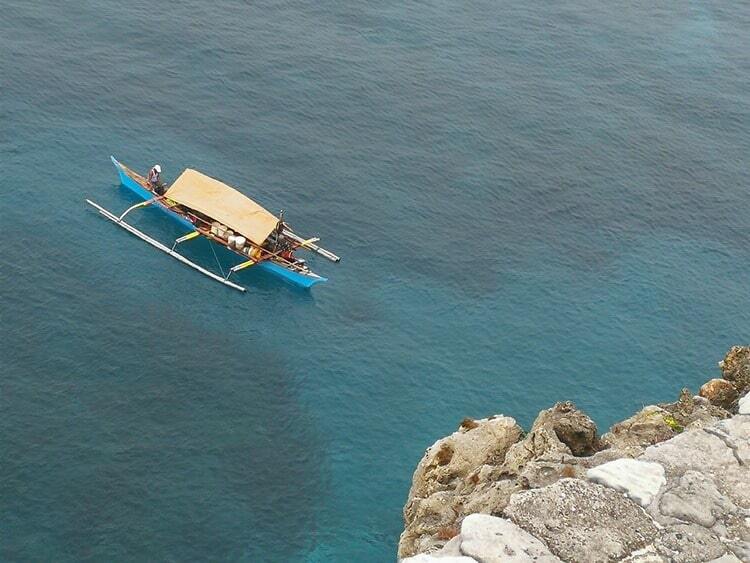 The Boat Trip: The first thing you will want to prepare yourself for is the boat ride to Fortune Island. The waves will be very strong, so if you get sea sick, make sure you take some medication beforehand. Click to see our personal favourite these Sea-Band Wristbands. In order to avoid the worst of the waves it is recommended you arrive/leave the island around 7 am or 3 pm. The Island: Once you arrive at the island you might be surprised at just how abandoned it is. Even though there will be other people there exploring, all of the dilapidated structures give it an extra adventurous vibe. If you haven’t been camping before, then also prepare yourself for the lack of bathrooms, water and electricity. For someone who is used to having those things around, especially on vacation, this can be quite a shock to the system. This is the perfect location to take plenty of pictures. 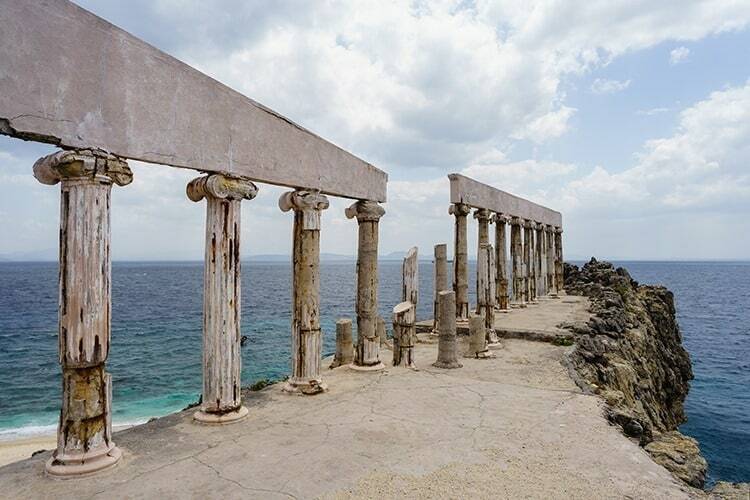 The most popular picture spot on the island are the Athens inspired pillars of the acropolis. Back when the island was a resort the owner wanted to recreate the acropolis as closely as he could. Although the pillars and Greece-inspired statues of mythical creatures and gods have started to deteriorate (some people think they won’t last another 10 years without being maintained), they certainly do add to the look and feel of the abandoned island. The pillars aren’t the only part of the island that make a great spot for pictures. The water is so clear that you will easily be able to photograph the beautiful coral and even schools of fish as they swim by. Camping can be an exciting activity for anyone who has ever dreamt about spending the night on an abandoned island. Due to the lack of electricity and running water, this will be very reminiscent of camping in the woods. The big exception will be the weather. If you go during the popular season (May to September), be prepared for very hot and humid weather. The crystal clear blue water is perfect for going for a swim. Because of the warm weather, the water is typically a perfect temperature. You will want to be careful to swim in one of the coves, so that you don’t get caught in the undertow. Also make sure you are aware of any coral around, as that can be quite sharp. The lighthouse on Fortune Island is a beautiful site to hike to. It only takes about half an hour, but it will give you a fantastic view of the island and is another great opportunity for photos. Scuba diving is a must on Fortune Island. The beautiful coral and abundant sea life, combined with the clear water, make this a once in a lifetime experience. There are three main locations that people scuba dive at on the island; The Blue Hole, The Wreck and Fortune NW. The Blue hole is actually an underwater sinkhole, that if followed all the way through will bring you to an open cavern! The Wreck is about 70 feet beneath sea level and once you reach the bottom you can explore the remains of a Dutch ship as well as a Volkswagen bus. The Fortune NW is between both of those locations and is filled with coral, allowing you to dive as far as 130 feet. Is scuba diving a bit too extreme for you? Then snorkeling is another great activity to plan when visiting Fortune Island. Because of the clearness of the water, this place was made for snorkeling. There are various areas surrounding the island that are perfect for snorkeling where you can see the colorful coral and fish. Do you enjoy extreme sports, or are looking to try something new on your vacation? Well cliff jumping is a very popular activity on Fortune Island. The main place for cliff jumping is located at the back of the largest hill on the island. It won’t be hard to find as it tends to be one of the more popular spots. When you arrive at Fortune Island you will notice a tall stone monument on the beach. Although this may not look very interesting from far away, you will want to make sure you get a closer look. Inside you will find a human skull. Although the inscription on the monument has faded, local tour guides will be happy to inform you about the stories that surround the skull and how it was found on the island when the original resort was being build. 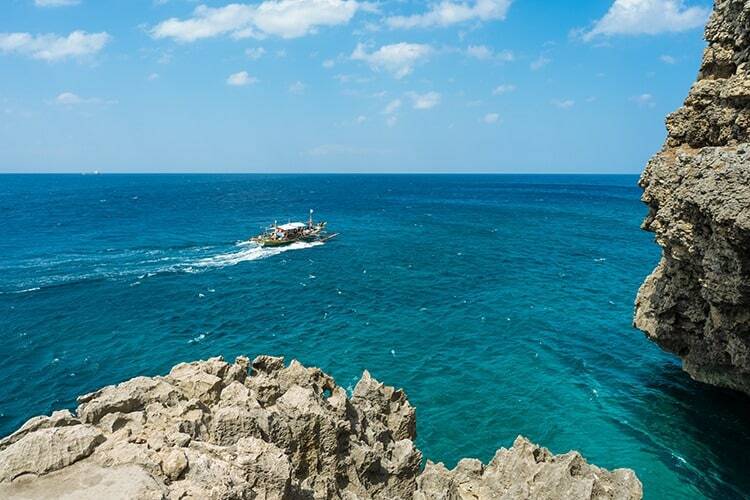 There have been many shipwrecks off the coast of Fortune Island, a few of which are still viewable by snorkeling or scuba diving. The first recorded ship wreck was the San Diego, which happened in the 1600s. Although this shipwreck is no longer viewable, there is a replica of the ship on the island that you can explore. The other two shipwrecks, the MV Kimelody Cristy and the MV Princess of the Orient all happened in the past 30 years and are still remain in the waters off of Fortune Island. Another enjoyable activity on Fortune Island is simply to relax. 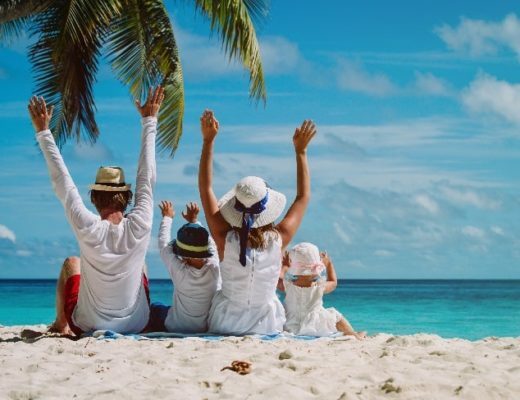 The soft beaches, sunny weather and calming waves are sure to bring out any ones inner beach bum and melt away any stress that you’ve been carrying around. Regardless of which activities you decide to partake in when visiting Fortune Island, you are guaranteed to have a memorable time and will want to return over and over again. Boat rental: Group of 5-10 P3000 for day tour and P4500 for overnight. More than 10 people: P4500 for day tour and P6000 for overnight. When are you planning a trip to Fortune Island? Are you planning to go for a day trip or an overnight stay? We(2 people) would like to go Fortune Island on 10th of December for a day trip. Have fun planning and hope the weather is perfect for you guys!